Last Father’s Day; in-laws from northern Iowa were visiting our farm. It was one of those early summer days when going fishing seems like a natural activity, and one of our guests is an avid fisherman. When I suggested we throw a few lures and worms in a nearby farm pond, Gus Cleveland, of Lake View, jumped at the chance. In less time than it takes to say ‘largemouth bass’, we were flinging lures into the clear pond water. In about 20 minutes we had caught and released a couple of nice 1-2 ½ pound largemouth. All of those bass gave our ultra-light rigs a real test. But when Gus shot his shallow running bass lure near the earthen dam of the 6-acre pond, he instantly set the hook on a fish that was different from our usual catch. Several minutes and 20 dive-and-runs later, Gus beached a five-pound wiper. The wiper, a hybrid fish that is a cross between a striped bass and a white bass, is a superb fighter and has, in recent years, been stocked in some larger farm waters. “Wow! What is it, a striper?” Gus asked me. I told Gus about the hybrid and that many claim a wiper fights like a smallmouth on drugs. I explained that wipers are commonly stocked in public waters but these had come from a private hatchery several years ago. We took several photos, admired the fish, and returned it to the water. Owners of private ponds or impoundments have two options when stocking a new pond or restocking fish in their waters. The first option, the state-run fisheries, is one of which many sportsmen and sportswomen are readily aware. The Iowa State Department of Natural Resources runs 8 fish hatcheries across the state. These state hatcheries function to stock and restock the numerous public waters in Iowa. For example, state fishery crews readily collect more than 150 million eggs to meet walleye stocking requests alone. 3) The pond or water must be fenced from livestock and have a 60’ barrier or buffer area between water and the border fence. For years, the Iowa DNR has recommended a bluegill, largemouth bass, and channel catfish mix for small state ponds. And, according to Iowa DNR Fishery Biologist Ben Dodd, that advice is still valid today. Dodd says the Iowa DNR still believes the best mix of fish for a farm pond is the old standby of bluegills (prey) and largemouth bass and channel catfish (the predators). Bluegills are prolific breeders; one female may lay up to 4,000 eggs per year, and these bluegill fry become the principal prey fish for predators. 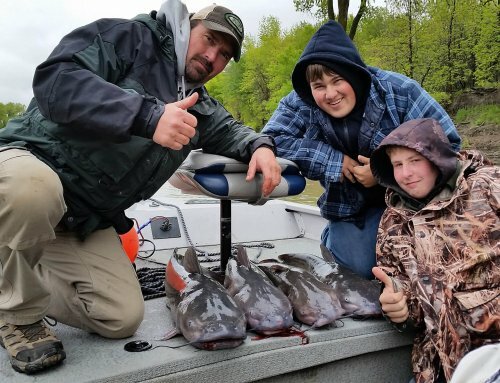 If a pond is approved for stocking by the DNR, bluegill and channel catfish are stocked in the fall, and largemouth bass are provided for stocking the following June. After notification of the landowner, the DNR will deliver the agreed number of fish to centrally located regional locations. Pond owners are responsible for bringing a prescribed amount of pond water for the transportation of the fish to their ponds. To restock a farm pond with fish populations already in the pond, a pond owner must look to the second option – the private hatchery. These private hatchery operations are essential to many pond owners or managers who wish to restock their waters. The sheer number of waters magnifies the reason that private hatcheries are so vital to owners of private ponds and impoundments, and the need for private fisheries grows each year with the growing interest in pond fishing. The private hatcheries offer a variety of fish, plus some of the old stand-bys that are great in ponds. For example, walleyed pike are ideal for farm pond stocking but are available only from private dealers. A look at the Iowa Department of Natural Resources web site will give you a complete listing of private hatcheries in Iowa, including contact information and the fish they sell. Go to HYPERLINK “http://www.iowadnr.gov/fishing”www.iowadnr.gov/fishing; on the left side of the page, click on ‘About Fishing in Iowa’. That will take you to ‘Iowa Farm Ponds’, and the first listing there is ‘Farm Pond Stocking’; the list of private fish hatcheries is a separate link at the bottom of that page. There is also information about pond balance, plants, damage, and renovation. ‘Private hatcheries’ are so named because individuals run them, not because only certain people or businesses can buy from them. 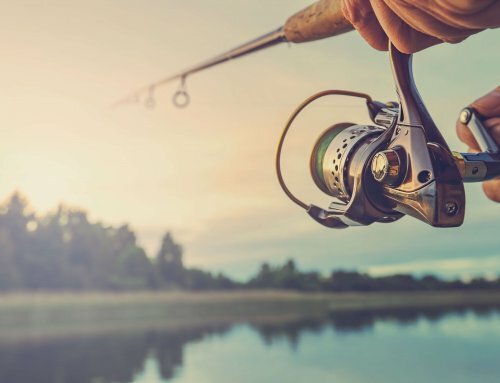 The interest in farm pond fishing has grown proportionally with the proliferation of farm pond construction, which has intensified through the years. With all of the construction activity of the last few decades, it is not known today exactly how many farm ponds are in the Hawkeye State. For example, Paul Goldsmith, the District Conservationist stationed in southern Iowa and a farm pond expert, says the federal government assistance plan has helped dramatically with pond construction over the years. 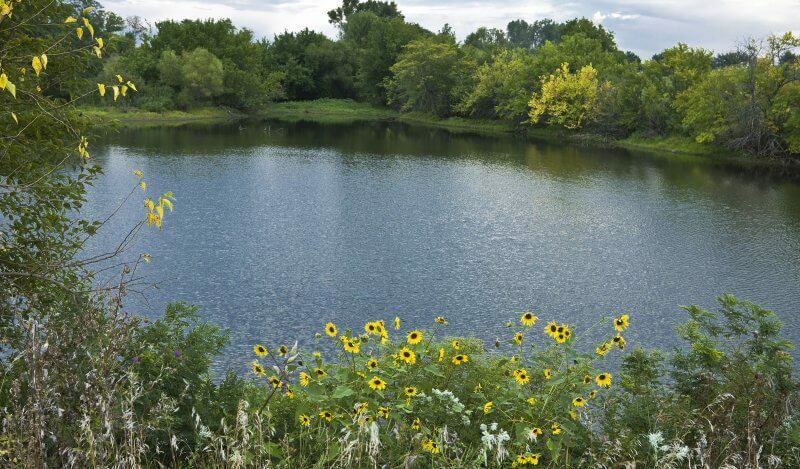 In one southern Iowa County alone, more than 650 ponds were built with assistance in the past 20 years alone. However, many others were built without any federal help. On the average, for every 10 ponds constructed, eight receive government assistance and two are built using only private funds. Using conservative estimates, some experts put the number of private waters over 30,000. A properly managed farm pond can provide excellent fishing opportunities. An average pond contains about 200 to 275 pounds of bluegills per surface acre, and they can be taken the second year after stocking. In the same pond, some 60 to 75 pounds of bass per acre are residing. The bass should not be removed until after the 4th year, and then only with strict limits. The IDNR recommends no more than 12-15 bass, longer than 14 inches, be removed from the water on a per-acre basis. To keep a pond productive, it’s easy to see why pond owners will need to have a regular restocking program, particularly for catfish. Private hatcheries offer a wide variety of fish for stocking and re-stocking private waters. Following are some of the species that are available from private dealers and have been stocked in Iowa ponds and impoundments. Almost also have the three basic pond fish – the largemouth bass, bluegill, and channel catfish. Frequently called ‘Old Glass Eye’, the walleye is a well-known lake fish that is now often stocked in colder, deeper ponds. 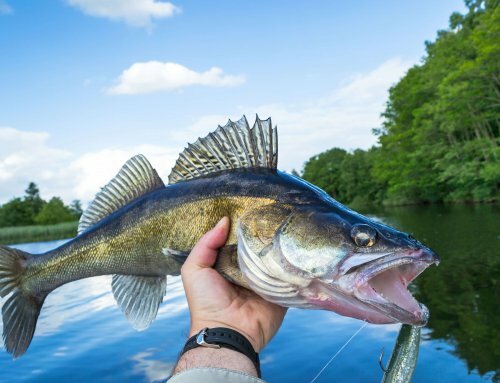 Walleyes are rarely added to many farm ponds but are an excellent slow-growing predator that sports a healthy mouth of teeth for grasping and securing small fish. However, they do not reproduce in farm ponds and will require periodic restocking. This is another denizen of many Iowa lakes and the introduction of the voracious northern pike is one of the least used options for pond owners. Frequently called the ‘wolf of the water lilies’, the northern is one of fresh waters’ most efficient predators. While the fish might work in very large ponds, northern pike are tough guys and might outgrow a farm pond. One drawback is that pike grow to large sizes and will feed on largemouth bass. Again, restocking is necessary on a periodic basis. A larger cousin of the channel catfish, the blue cat is another rarely stocked pond predator. This large scavenger/predator can grow to huge sizes, even in a pond. The blue cat can really add a big predator to ponds. They are available from time to time from private hatcheries and can provide ponds with a real trophy. Restocking is necessary. Many Midwest farm pond owners have added black crappies or white crappies to their pond waters with, black crappies being the most popular. 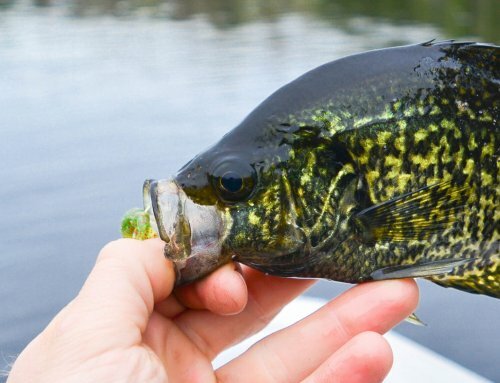 Excellent table fare, the big-mawed crappies prey on small bluegills. 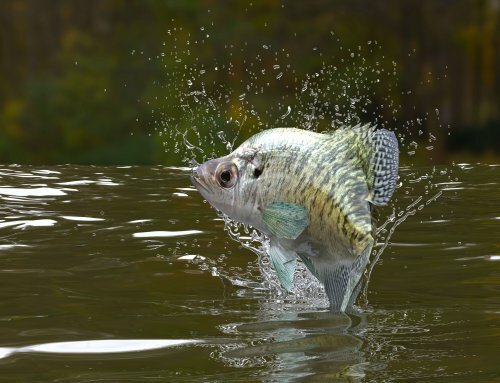 The drawback to the crappie introduction is that the fish sometimes can overrun a small pond and then may provide only stunted fish. Beemer says no restocking is necessary and that they thrive on heavy fishing pressure. Some new possibilities are now available from private fish growers or hatcheries. One of the promising newcomers is the wiper, a hybrid cross between the white bass and the bigger, more aggressive striped bass. Sporting a set of teeth like a walleye but a true bass, the wipers are a formidable predator that can grow up to be 8 to 10 pounds or more in a large farm pond. Initially stocked in impoundments to control shad populations, the voracious feeding wiper is a deadly predator that preys on the fry of bluegills and bass. The hybrid wipers don’t multiply in ponds, so restocking every few years is necessary. The wiper displays some rather remarkable antics for the fisherman. As described earlier, when hooked, a wiper fights like a smallmouth on drugs. Fishermen sometimes see the wiper in action without realizing it. Sometimes when feeding, several wipers will actually drive prey fish to the surface, causing the baitfish to leap out of the water in an attempt to escape the speedy pursuers. The speed of these hybrids is legendary. On our recent visit to the Beemer Fisheries, we wanted some small 2 to 3” wipers for restocking. Randy inadvertently illustrated the speed of the fish when he was unable to net even a few of the hybrids without first using a mesh divider and draining some of the water from the tank to give the fish less room to move. “You can see why people like catching these guys,” he grinned as he finally netted several of the wipers for us. Wipers are becoming one of the most popular of the ‘new’ pond additions. Restocking is necessary on a regular basis. The white bass is another fish that Beemer says has been successfully tried in some Missouri and southern Iowa ponds. In ponds, these fish usually attain a weight of from one to three pounds. As with their cousin, the wiper, reproduction capacity in ponds is questionable for white bass and restocking is usually recommended. The yellow perch is yet another water denizen that is often added to many colder, deeper ponds and impoundments. The hungry perch devour many of the fry and fingerlings of any species. Prolific, the perch are a table delicacy and can grow to weigh about a pound in a pond. A pan of fresh filets of perch is one of nature’s greatest delicacies. Reproduction in a farm pond is questionable and catches would have to be monitored. When ponds are silted or shallow edges become clogged with waterweeds, grass carp can be purchased from most of the private vendors. Contrary to popular belief, these grass and weed eaters do not multiply in ponds and some periodic restocking may be necessary. Today there are eleven private fish hatcheries in Iowa, scattered widely over the state. Some deal in a wide variety of species of fry and fingerlings, while others specialize in fewer species. A list of Iowa Aquaculture Producers, according to a survey, is given on the Iowa DNR website. An index is available that lists all of the species each hatchery sells. These private hatcheries provide fish for both new and restocked ponds. It’s easy to see how hatcheries serve even ponds previously and regularly stocked with DNR fish. With the boom in the interest in farm pond fishing, it’s easy to see how important the role of the private fishery is.